The recent death of Milton Friedman produced an outpouring around the nation and the globe of remembrances and praise for his contributions to economics and government policy. Friedman, who died Thursday, Nov. 16, in San Francisco, where he lived with his wife and fellow economist, Rose Friedman, was the Paul Snowden Russell Distinguished Service Professor Emeritus in Economics. 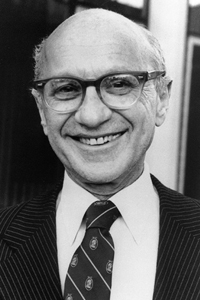 As the premier spokesman for the monetarist school of economics, Friedman promoted the value of free market economics when the position was not at all popular. “He was clearly the most important economist of the 20th Century,” said Gary Becker, University Professor in Economics and the 1992 recipient of the Nobel Prize in Economic Sciences. Becker and a group of his fellow economists from the Department of Economics and the Graduate School of Business gathered for a panel discussion at the GSB, where they offered reminiscences of Friedman as a teacher and colleague. Those faculty members who joined Becker are: Eugene Fama, the Robert R. McCormick Distinguished Service Professor of Finance in the GSB; Anil Kashyap, the Edward Eagle Brown Professor of Economics and Finance in the GSB; Robert Lucas Jr., the John Dewey Distinguished Service Professor in Economics and the College; and Sam Peltzman, the Ralph and Dorothy Keller Distinguished Service Professor Emeritus of Economics in the GSB. In addition to the panel discussion, the GSB’s student-run Milton Friedman Group gathered to hear about his philosophy and to view portions of a new Friedman biography that will air nationally on PBS stations on Monday, Jan. 29, 2007. He was a leading opponent of John Maynard Keynes (1883-1946), whose interventionist theory contended that the government should be heavily involved in managing national economies. Friedman maintained that the economy functions best when people have opportunities to make free choices unfettered by government regulations. Friedman and his wife, Rose, were the authors of a number of influential books, including Capitalism and Freedom and Free To Choose. Free To Choose was published as a companion book to a public television series by the same name. Ronald Reagan, Margaret Thatcher and many free-market leaders in Eastern Europe were devoted followers of the Friedmans’ views. Friedman came to the University to study economics after graduating with a B.A. from Rutgers University in 1932. He met Rose Friedman while both were students at Chicago, and he received an M.A. in Economics from Chicago in 1933. A research assistant for the Social Science Research Committee at the University from 1934 to 1935, Friedman joined the University faculty in 1946, after completing a Ph.D. in Economics at Columbia University and serving as an economist with the U.S. Treasury Department and a number of other agencies. At Chicago, he and his colleagues continued a tradition of taking the study of economics seriously by treating it as a science, and they joined other leading economists to found the Mt. Pelerin Society in Switzerland in 1947. In 1951, Friedman won the John Bates Clark Medal, which is given to economists under age 40 for outstanding achievement. His first important work was published in the book Income from Independent Professional Practice, which he co-authored with Simon Kuznets. In the book, he contended that state licensing procedures limit entry into the medical profession and accordingly, doctors can charge higher fees than they could if competition were more open. Throughout his career, Friedman discredited many of the Keynesian theories that were in vogue at the time Friedman began his work as a professional economist. In 1957, for instance, he published A Theory of the Consumption Function, which contested one of Keynes’ main positions: that people spend less of their income and save more as their societies become wealthier. Friedman showed that people always want more, no matter how wealthy they become. The book also showed that people’s annual consumption is a function of their expected lifetime earnings, rather than a reflection of current income, which was the Keynesian view. 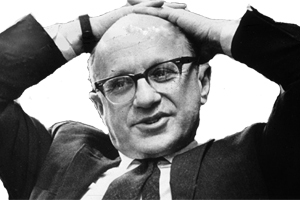 In his book, Capitalism and Freedom (1962), Friedman made many recommendations that eventually became economic policies. He supported flexible exchange rates, a permanent departure from the gold standard, a volunteer army, a negative income tax, trucking and airline deregulation, competition for the Post Office and a broader-based income tax. He examined the Great Depression in his book A Monetary History of the United States (1963), which he co-wrote with Anna Schwartz. Friedman and Schwartz blamed the Depression on the failure of the Federal Reserve Bank to prevent bank panics, as had been its charge when it was created in 1913. In 1968, Friedman and economist Edmund Phelps of Columbia University conceived of what was called the “natural rate” of unemployment. Friedman pointed out that if unemployment falls below a “natural rate,” inflation follows. Government policies that promoted full employment during the 1960s and 1970s led to inflation going from 1 percent in 1960 to 13 percent in 1979. Friedman’s work reached people outside academe in ways that few economists ever do. For example, from 1966 to 1984, he wrote a column for Newsweek magazine. The 10-part PBS series “Free to Choose,” which was broadcast in 1980, attacked welfare dependency and centrally planned economies, and it prompted a national debate about economics. As his fame grew, Friedman was invited to advise governments around the world, including Chile and China. More recently, he became a strong advocate of vouchers to encourage school choice. “Milton was an intellectual entrepreneur, with an insatiable curiosity and a passion for clear thinking,” said Bob Chitester, who produced the popular PBS series “Free to Choose.” PBS will air nationally a new biography of Friedman, “The Power of Choice,” on Jan. 29, 2007. “He set forth ideas without regard to their popularity or acceptability. He has been equally tough on himself and others in his search for tools of analysis that consistently and accurately predict outcomes in both micro- and macro-economics. And he has never compromised the resulting analysis to please those in power. Such courage is essential to the survival of a free society,” Chitester said. Friedman is survived by his wife and colleague of many years, Rose Director Friedman; a daughter, Janet; a son, David; four grandchildren; and three great-grandchildren.